For several years before the 2008 crisis, the Chief Economist of Morgan Stanley, Stephen Roach, was bearish about the US economy and warned about excesses in the system. Then he changed his mind and said things were fine. Unfortunately, that was just weeks before the crash. And now Jeremy Grantham, the founder of fund manager GMO, has thrown in the towel. Grantham called the 2000 and 2008 tops, and the 2009 bottom, but had been bearish on the stock market in recent years. His poor fund performance as a result has caused investors to yank money out of his fund, which has fallen from $ 124 billion under management in 2014 to about $ 80 billion now. This is a real dilemma that fund managers face. If a fund manager decides that markets are overvalued, becomes bearish and holds a large cash position or goes net short, his performance will lag his peers, if the markets keep rising. Investors punish such funds managers by withdrawing money from their funds. But if they stay invested regardless of how concerned they are, then when there is a major crash, they cannot be held responsible as all their peers will also have had major losses. This peer comparison pressure creates substantial upward bias, and propels the bubble until it does inevitably burst. The same logic applied in 2000 and 2008. He cites globalisation, increasingly monopolistic US companies and super-low interest rates as having pushed corporate profit margins well above their long-term average. 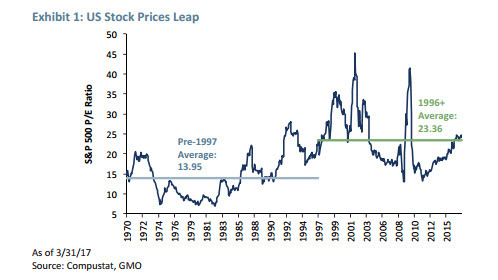 He presents the chart below as evidence that the P/E ratio for US stocks since 1996 is now at a permanently elevated level compared to earlier years, and so the current market P/E (Price/Earnings) ratio of 26.1 (compared to the long term historical average of 17) is just fine. Nothing to see here, folks. Firstly, Mr. Grantham’s conversion reminds me a lot of Mr. Roach’s change of mind at just the wrong time, and may be a telling contrarian indicator that things may be about to go south in a hurry. Secondly, his argument sounds very similar to Yale Economics Professor Irving Fischer’s in 1929 who, just days before the Crash of 1929, expressed his expert opinion that stocks were not overvalued: “Stock prices have reached a permanently high plateau.” As an investor in the market, he eventually went bankrupt. Thirdly, even if corporate profits are at all-time highs, these elevated earnings are already included in the E part of the P/E ratio. Investors are paying a lot more for the same dollar of earnings. Fourthly, earnings are subject to accounting gimmicks. Let’s look at a more honest number, median price/revenues for the S&P500. This ratio is now almost 2.5, the highest it has ever been. At the peak of the 2008 bubble, the ratio was about 1.85. So, if it is not record revenues that are driving earnings and share prices, then what is? 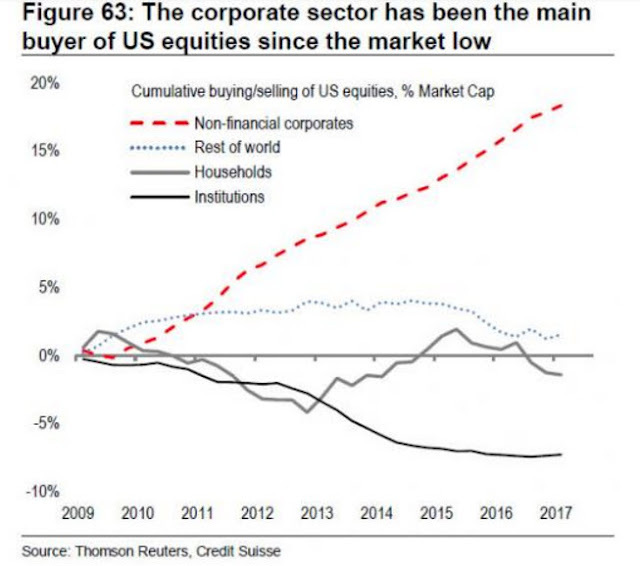 As Credit Suisse analyst, Andrew Graithwaite notes: “What this means is that since the financial crisis, there has been only one buyer of stock: the companies themselves, who have engaged in the greatest debt-funded buyback spree in history.” Corporations have leveraged themselves massively and corporate debt is at all-time levels, just to pay out dividends and buy back their own shares. The mirage of corporate profitability has been driven by share buybacks, wage reduction, and productivity increases. There is only so much you can cut costs before impairing the long term health of a business. And, finally, look at this chart. The reason share prices are at record highs is the amount of easy money all around the globe chasing financial assets and real estate. It is basic economics that when demand exceeds supply, prices will rise. So when there are trillions of dollars that cannot find a decent yield in bonds, they will chase risk assets and bid up prices. Rising prices do not necessarily indicate the health of an economy, nor fair value. Unlike Mr. Grantham, I believe we are in a massive bubble that is poised to burst. Rising interest rates and the Federal Reserve’s stated intention to engage in Quantitative Tightening (QT) later this year will pull liquidity out of the markets. 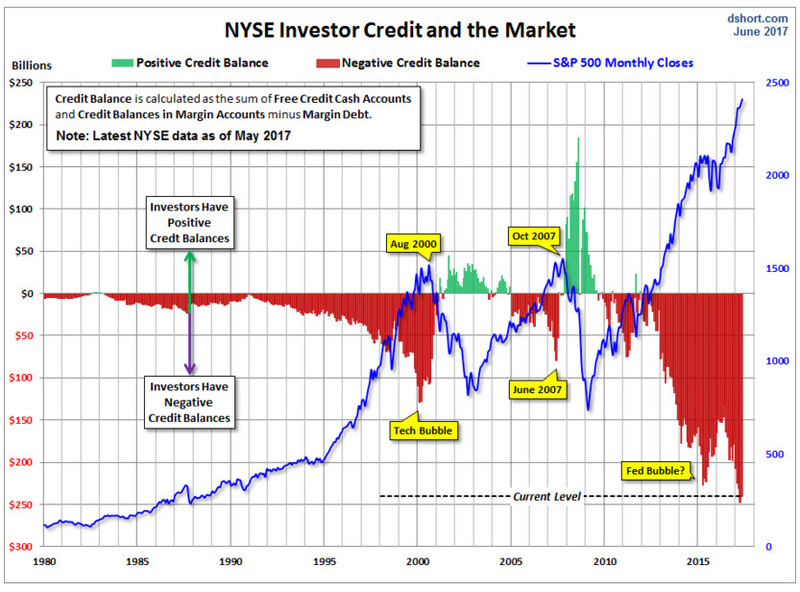 To truly understand how out of balance things are, look at the chart below. Share prices have been boosted by massive amounts of credit taken on by investors, particularly corporations. Another less understood challenge is how narrow the leadership in the US stock market has become. In 1996, there were 7,300 publicly list companies in the US, today there are only less than 3,500 (excluding REITs, collective investment vehicles such as investment and mutual funds, and over-the-counter listings), according to a 2015 report by the National Bureau of Economic research. The number has shrunk due to mergers and acquisitions and de-listings. In 1975, the top 100 corporations generated 48.5% of all corporate profits. In 2014, that number was 84.2%! (Source: Mark Hulbert, Marketwatch, June 12, 2017). Just 50 stocks account for about half the capitalisation of the S&P 500. So, when Grantham says “This is the broadest market of all time… That is not the nature of a bubble” he doesn’t seem to understand how dangerously narrow the market has actually become. The VIX (which is a measure of greed and fear in the markets) this month reached its third lowest level in history, which means investors have no fear of the equity market falling. Investors are ignoring any bad news they encounter: the collapse of the Trump legislative agenda, North Korea’s nuclear saber rattling, the criminal investigation into election collusion with the Russians, rising interest rates and QT, the first Moody's downgrade of China in 30 years, etc. None of it matters, until it matters! This is now a confidence game and when confidence is shattered, the rush to the exits will be dramatic. The market has run on debt-infused steroids. Global debt is up 50% from 2008. After the 2008 debt crisis, total global debt is up 50% in just eight years. Think about that. I think the tide is about to turn. This time is different, because when this bubble bursts, previous crashes will seem tame in comparison.